12 October 2018 was a day of double celebration at Chatsworth Bukit Timah. The campus was officially inaugurated by Mr. Tyler Sherwood, Head of Chatsworth Group of Schools on a day where our community celebrated the United Nations (UN) Day, our annual school tradition and for the first time at the campus. 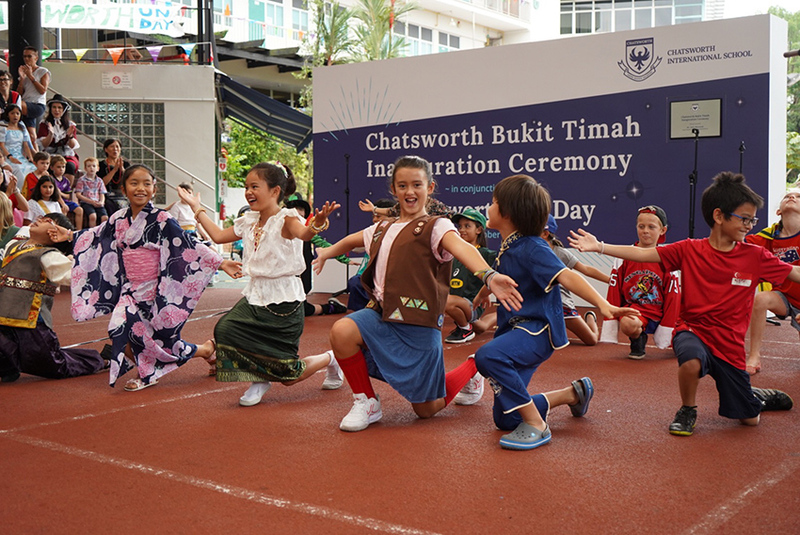 In the presence of our distinguished guests and school community comprising teachers, students, parents and staff, Mr Sherwood pressed the launch pad to unveil our opening plaque, thereby marking the official inauguration of Chatsworth Bukit Timah. As short and sweet as the program began, the inauguration ceremony concluded with a lion dance performance and most beautiful delivery of our 'We are one' school song. The eventful day continued with an array of activities planned for the 2018 UN Day themed 'Potential in Diversity'. The activities included entertaining song and dance performances by students and parents, scrumptious international cuisines, engaging homeroom activities, a lively charity bazaar and culture assembly in the final closing attended by the both primary and secondary school. You can view the photo album of the day's celebrations here.